The NHS is ‘drifting’ and more action is needed on pay, according to ex-health secretary now Manchester mayor Andy Burnham. The Labour elected mayor told an NHS staff skills, retention and recruitment conference in the city that his region’s ‘vision of a 21st century NHS’ could be adopted more widely. He said: ‘The NHS is heading to its 70th anniversary on July 5 and I’m not going to make this a party political speech but it’s drifting. 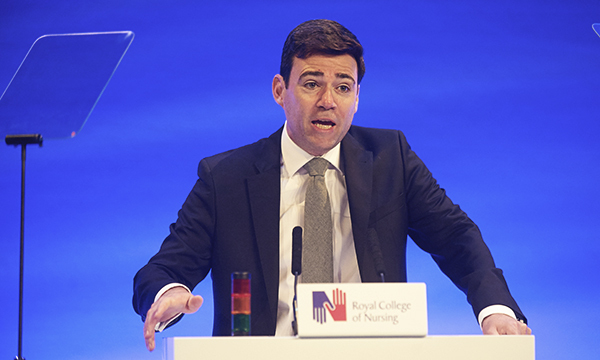 Mr Burnham told the RCN congress in 2017 that the cap on nurses' pay need to be lifted. Staff are currently being consulted on a pay offer. Mr Burnham raised concerns about whether nursing and other healthcare professions are still attractive to people on lower incomes. He said that boroughs in Greater Manchester would have been recruiting grounds for the NHS 20 to 30 years ago. Mr Burnham sits on the board of Greater Manchester Health and Social Care Partnership, which controls the health and social care budget for the area's 2.8 million population. He has asked the partnership, which comprises NHS providers, local authorities and other bodies, to consider offering nursing students incentives to stay in Manchester once they graduate. The proposal would mean that healthcare graduates from Manchester universities who commit to work for the NHS in the region for a number of years would receive help paying off their tuition fees or with housing.